and his recently published book on "Klassische Stundenastrologie. Ein Lehrgang zum Selbststudium" ("Classic Horary Astrology. A Training Course for Self Study") – Chiron Verlag. Tübingen 2008. ISBN 978-3-89997-167-5, 198 p., 22.90 €. Erik van Slooten, a Dutch astrologer, lives and works since many years at Munich, Germany. Erik, former vice-president of DAV, has passed the DAV-examinations 1991. He is member of the DAV-conference committee and is lecturer for classic astrology at the national astrological school of CIDA ("Italian centre of astrological studies") at Bologna. He is one of the most famous experts in horary astrology in Europe. Without him, the unprecedented revival of classic and horary astrology in German speaking countries and on the European continent since the early 1990’s would not have been possible. Erik focuses on horary astrology as a means to answer important yes-no questions of everyday and personal life. He too focuses on resuscitating the classic techniques of natal astrology. Erik has published several books in German language, he delivers workshops and lectures in Germany, Switzerland, Austria, The Netherlands, Belgium and Italy in German, Dutch and Italian. He became also famous as multilingual astro-cabaret artist on astroconferences at Munich, Bale, Milan … and of course on many DAV-conferences. 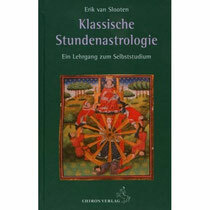 His recent book "Klassische Stundenastrologie" ("Classic Horary Astrology") was published this year by Chiron publishing house (at Tübingen, famous university town upon the Neckar in Southwest Germany). It is made up as a training course for self-study, beginning with basic rules of horary astrology, and continuing with rules of localization and dating, and of electional astrology. The techniques developed by great horary astrologers like Masha'allah and William Lilly arey taught precisely. Erik's wife, Sonja van Slooten, has contributed a chapter on classic medical horary work. At the end of each chapter the reader will find questions and exercises allowing a precise training control. Answers and solutions are given in the appendix. A beautiful, a mature, a pragmatic and at the same time sage work that quickly will get a benchmark in Astrology!